Most of us play our golf without anyone other than our fellow competitors or opponents watching us, thank goodness! But there are times when occasional spectators, other players that are not in our group or even casual onlookers around the boundaries of the course may have a direct influence on our game, whether intentionally or unintentionally. The first thing to note is that in the Rules of Golf a spectator is an outside agency. In fact, in stroke play, any person other than a playing partner (i.e. someone on the player’s own side) and any caddie of the side is an outside agency, including fellow competitors. Knowing this helps in arriving at the correct ruling where a spectator is involved. The most common occurrence is when a ball is accidentally deflected or stopped by a spectator, a true example of a ‘rub of the green’. If this happens following a stroke from anywhere other than the putting green, under Rule 19-1 there is no penalty and in most cases the ball must be played as it lies. However, if the ball comes to rest in or on the spectator or their belongings, the ball must through the green or in a hazard be dropped, or on the putting green be placed, as near as possible to the spot directly under the place where the ball came to rest in or on the outside agency, but not nearer the hole. If the stroke was made from the putting green when it is deflected or stopped by an outside agency the putt must be cancelled and the ball replaced and replayed. In a case where the ball might have come to rest where X was situated if he had not deliberately deflected or stopped it, the player should be required to drop the ball at the spot where X was situated. For example, if another spectator (Y) had been behind X, the ball might have struck Y, if X had avoided it, and come to rest where X was situated. If there is no question that the ball would have come to rest somewhere else if X had not deflected or stopped it, the Committee must make a judgement as to where the ball would have come to rest, giving the player the benefit of any doubt. For example, if no person or object had been behind X and without any doubt the ball would have come to rest either in a lateral water hazard behind the green or in the rough just short of the hazard, the Committee should require the player to drop the ball in the rough just short of the hazard. An instance of this situation occurred to Japanese golfer, Ryo Ishikawa, in 2009, when one of his fans picked-up his ball while it was still rolling and walked off with it. See this link for details. If a spectator picks-up or moves a player’s ball at rest there is no penalty and the ball must be replaced, Rule 19-1. 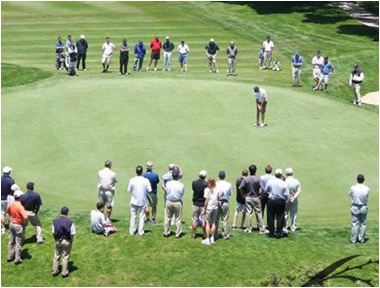 A player may receive help from spectators to remove a large loose impediment, Decision 23-1/2. Information received from a spectator may be used to identify a player’s ball, Decision 27/12. A Committee may take into account the testimony of a spectator when there is doubt as to the number of strokes that a player has made on a hole, Decision 6-6d/5. A spectator is permitted to advise a player how far from the flagstick his fellow competitor’s or opponent’s ball lies, Decision 8-1/5. A spectator is permitted to give information on the Rules, Definition of Advice. Now a thought for the week: Why is it that the slowest golfers are usually in front of you, and the fastest behind you? Edit - Good Friday: Easter started badly for Ernie Els at The Heritage, Hilton Head, when he was informed in the scoring trailer that he had incurred a two stroke penalty on the penultimate hole of his first round. He had walked through a greenside bunker to survey the green and then raked over his footprints before playing his third shot from that bunker. When asked about this breach of Rule 13-4 Graham McDowell, who was playing in the same group as Els, summed it up perfectly by replying, "It's a pretty basic one". If you are a subscriber to my weekly email series, ‘Rhodes Rules School’, and find the illustrated Q&As interesting and of benefit to your game, then please recommend the subscription to your golfing friends. You can either email me with their name and email address (rules at barryrhodes dot com) or forward this sign-up link to them, http://forms.aweber.com/form/80/425590380.htm.